There are six steps to assign names to the groov I/O modules and their channels. This is referred to as mapping the I/O. 1. Double click the first I/O module in the tree to open a new GROOV_MODULE tab. groov EPIC Learning Center User: Double-click GROOV_MODULE (GRV-IACDCTTL-24). 2. 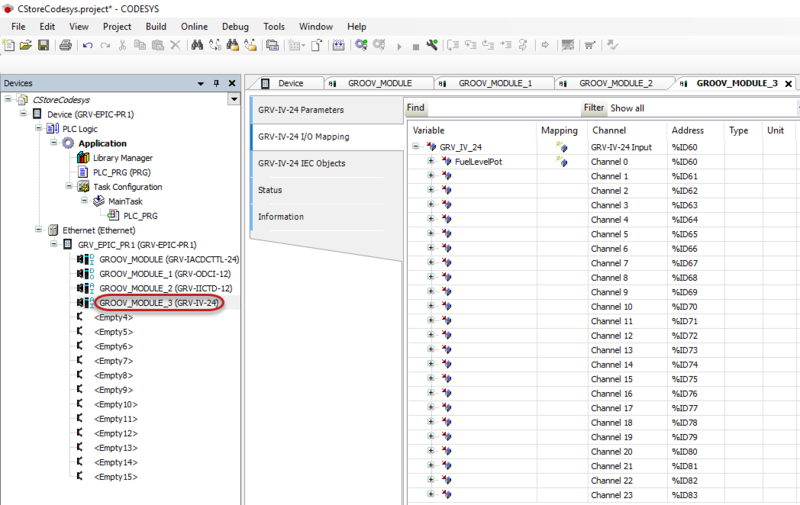 Click on GRV-IACDCTTL-24 I/O Mapping to see the Variable field. The module is currently unnamed. 3. Click next to the Variable icon, type in a name for the module, and press Enter. In this example, GRV_IACDCTTL_24 was used for the variable name. Note: Underscores ( _ ) may be used in a variable name, but not a hyphen (-). 4. Expand the Variable field by clicking the + for the Discrete Inputs. The 24 channels (points) available on this input module are shown. 5. Name the channels in the same way you named the module. groov EPIC Learning Center User: The names used for the groov EPIC Learning Center are shown. 6. 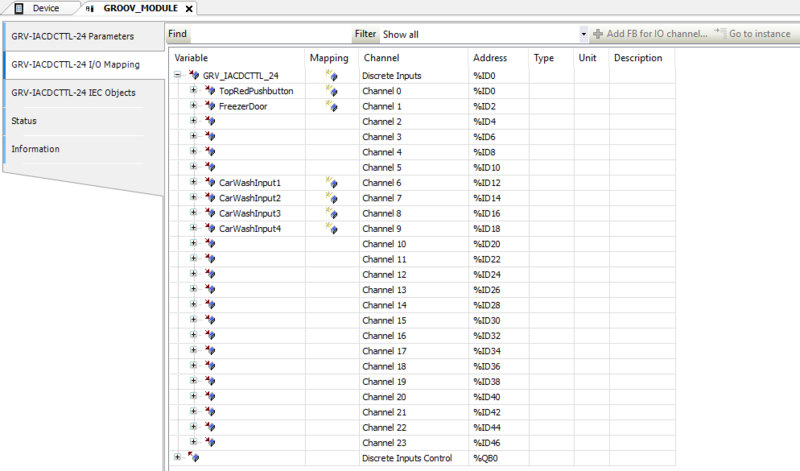 Continue to name the other modules and channels listed in the Device Tree in the same manner. a. Double-click the groov I/O module in the Device Tree. b. From the new GROOV_MODULE tab, remember to click the module’s I/O Mapping section to see the Variable name fields. c. See the examples below, noting how the output module is not named, but only the channels are named. groov EPIC Learning Center User: Notice how you have four module tabs open after configuring the modules. Modules and points are added to the project. Now you're ready to check module firmware version and update the controller firmware as needed. Steps to map the I/O.